Poor Bassie will have to live with the pins and screws for the rest of her life. Yikes! Former Miss South Africa and businesswoman Basetsana Kumalo hasn't had the easiest couple of months, to say the least. After falling at her son's school in March this year and enduring multiple fractures to her ankle, beautiful Bassie using her story to encourage others. Earlier today she took to her Instagram account where she detailed what had happened to her on the day with a collage of pics that showcased the extent of her injury. "Sharing my journey to healing with these images is to encourage you and give hope to anyone battling a severe injury, that no matter how bad and in pain you are, you will get through it," the encouraging post reads. "Some days are better than others," she said, adding that the pain comes and goes. She'll have to live with the pins and screws for the rest of her life. Soon after the incident, she she explained what had happened to clear up some nasty rumours about the incident. Messages of support and well wishes flooded her comment section. Many of you out of concern have been asking what happened to my leg. There have been rather interesting versions being peddled around by people and the media on how I broke my right ankle, one is that I apparently fell while running in the rain, yes I run 10km every morning but that's not what happened, another published by Sunday Sun claimed " friends close to former Miss SA,said she told them she fell while she was at home, but I told Miss SA organisers the incident happened at my son's school," others have even gone to the lengths of linking my husband to my fall...that's dispicable and diabolical, another version is that I fell down a flight of stairs at home at night! This is mischievous diatribe devoid of any truth! Sunday Sun has since apologised and retracted their false report upon receiving a stern letter from my attorneys! Here are the facts: on a rainy Thursday the 17th March, I went to watch our eldest son play piano at the school concert at 12h30. After the concert, at the school courtyard I slipped and fell, broke my right ankle both on the left and right side, and dislocated it as well. (Medical terms: fracture of the malleolus tertius, and the lateral & medial malleolus, and greater degree of further displacement) I have had 2 surgeries, 1st was for the reduction of the dislocation & 2nd the fixation of the ankle with 11 screws with a long plate. Worst pain of my entire existence. Contrary to popular belief I was not wearing my 6inch heels nor was I running....I was just walking to my car! More importantly my deepest and sincere gratitude to the parents and staff of my son's school who put me on a stretcher and got me to hospital in record time. Specifically my appreciation to Caron Mosehla, Michael Cabral & Ben Garrad, you were angels sent straight from the heavens above. I am so grateful for all your help. I also thank you all for your prayers and well wishes, it could have been worse. I am still alive, it could have been my head, spine and so I am not having a pity party, I am glorifying God! P.S. Ms Pinky (as I've named the cast) has her own wardrobe and dresses according to the weather. The crutches are bejewelled accordingly as well! But one thing is for sure, Bassie sure knows how to make an injury look good! 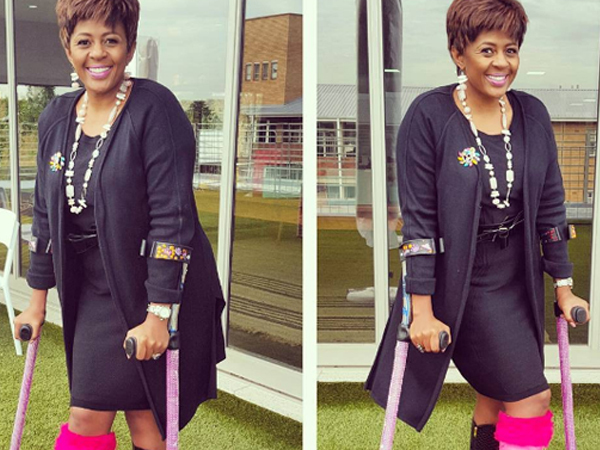 From bedazzled crutches to colourful and furry casts, she definitely brought the glam! We're just relieved that she's doing well and that, even through the pain, she's sharing her healing. Good on you, Bassie! Good on you!